Christmas Fireplace 3D unwinds you to the magic of the holiday that comes up to life on your desktop. Feel the warmth of a dimply-lit library with a big log burning in the fireplace. Enjoy the look of the ever-green shining with wreaths and festive colored lights. Discover presents from Santa Claus patiently waiting for their owner. On top of all this is the photo of you or your loved one on the mantelpiece. This adds realism to the 3D world. ...... Pretty boxes with presents from Santa Claus are waiting for the good boys and girls, who behaved well this year. The tune of the Christmas song adds more excitement to the scene. Qweas is providing links to Christmas Fireplace 3D Screensaver 1.2 as a courtesy, and makes no representations regarding Christmas Fireplace 3D Screensaver or any other applications or any information related thereto. Any questions, complaints or claims regarding this application Christmas Fireplace 3D Screensaver 1.2 must be directed to the appropriate software vendor. 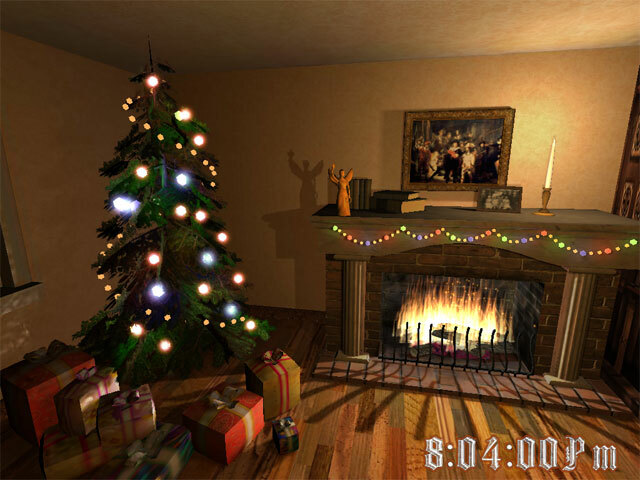 You may click the publisher link of Christmas Fireplace 3D Screensaver on the top of this page to get more details about the vendor.